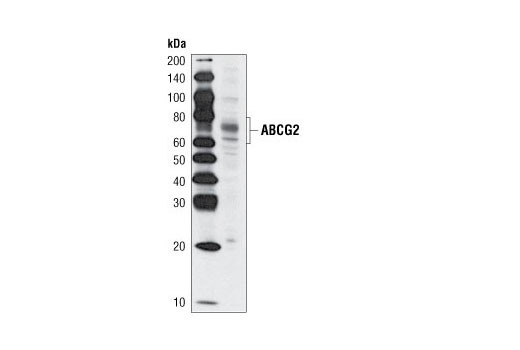 Western blot analysis of extracts from COS-7 cells, mock transfected (-) or transfected with a construct overexpressing human ABCG2 (+), using ABCG2 Antibody. Western blot analysis of extracts from RPMI 8226 cells using ABCG2 Antibody. 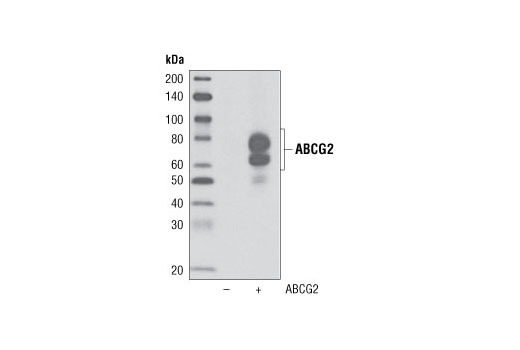 ABCG2 Antibody detects endogenous levels of total ABCG2 protein. Polyclonal antibodies are produced by immunizing animals with a synthetic peptide corresponding to residues surrounding Thr180 of human ABCG2 protein, which lies within the intracellular region of ABCG2. Antibodies were purified by protein A and peptide affinity chromatography. ABCG2 (BCRP1/ABCP/MXR) is a member of the ATP-binding cassette transporter family that functions as ATP-dependent transporters for a wide variety of chemical compounds and are associated with drug-resistance in cancer cells (1-6). ABCG2 is a heavily glycosylated transmembrane protein with six transmembrane spanning regions consistent with it functioning as a half-transporter. The ABC family can exist as either full-length transporters or as half-transporters that form functional transporters through homo- or heterodimerization. High expression of ABCG2 was found in placenta as well as cell lines selected for resistance to a number of chemotherapeutic drugs, including mitoxantrone, doxorubicin, topotecan and flavopiridol. In rodents, the highest expression of ABCG2 was found in kidney (8). ABCG2 expression has also been observed in stem cell populations, particularly in hematopoietic and neuronal stem cells and is downregulated with differentiation (9-12). Doyle, L.A. and Ross, D.D. (2003) Oncogene 22, 7340-58. Allen, J.D. et al. (1999) Cancer Res 59, 4237-41. Doyle, L.A. et al. (1998) Proc Natl Acad Sci U S A 95, 15665-70. Allikmets, R. et al. (1998) Cancer Res 58, 5337-9. Miyake, K. et al. (1999) Cancer Res 59, 8-13. Robey, R.W. et al. (2001) Clin Cancer Res 7, 145-52. Zhou, S. et al. (2001) Nat Med 7, 1028-34. Honscha, W. et al. (2000) Hepatology 31, 1296-304. Scharenberg, C.W. et al. (2002) Blood 99, 507-12. Islam, M.O. et al. (2005) Neurosci Res 52, 75-82. Bunting, K.D. (2002) Stem Cells 20, 11-20.